Buy through MusicWeb for £13.30/14.80postage paid World-wide. For a contemporary composer, having one’s work played/recorded by the Arditti Quartet is tantamount to a kind of endorsement of its merits, the granting of kind of imprimatur from the group perfectly justifiably described, in the Guardian in April 2005, as “the world's pre-eminent contemporary music quartet”. 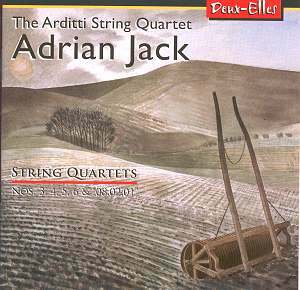 The quartets to be heard on this well recorded CD make it clear that the work of Adrian Jack deserves such an accolade. Played in chronological order of composition, the quartets (and quartet movement) recorded here span the years from 1996 to 2002. The Third Quartet, in four movements, the third and fourth played without a break, states its governing structures pretty clearly, its musical patterns being readily discernable for the most part. The music of this quartet is perhaps more emotionally open, less ambiguous or veiled, than that of the later compositions. The two-movement finale is particularly striking, beginning with a long, hushed section, full of a kind of delicate tension, its stillness pregnant with the possibility, or rather the certainty, of something very different. Sure enough, the second phase of the finale, the fourth movement of the quartet, marked “very vigorous and with abandon”, erupts into passionate and forceful writing; but its “abandon” is not so great as to preclude a very clear reiteration of one of the dominant motifs from the first movement. The sense of closure thus achieved and affirmed effects a resolution of many of the quartet’s tensions. The relatively extrovert emotional rhetoric of this Third Quartet is largely absent from the Fourth Quartet. Jack himself, in the booklet notes to this CD, describes this quartet as “perhaps, my most inward and meditative quartet”. The quartet is in three movements, in the first of which the Arditti articulate perfectly the composer’s characterisation of it as “secretive and mysterious”; the rhythmic vitality of the writing ensures that the ‘mystery’ never becomes merely self-indulgent. The second, slower movement is far more relaxed and exudes a degree quasi-nostalgic wistfulness, even melancholy, a sense of a mind easing into itself, a turning inwards rather than an engagement with its immediate surroundings or the issues they raise. The final movement renews the rhythmic impetus and with it the sense of an engagement with the world beyond the self – though not without recurrent moments of meditative withdrawal. The closure-avoiding tentativeness of the final bars, the resistance to the kind of closure so neatly effected in the earlier quartet, constitutes in the terms of the quartet’s musical idioms, a refusal – or an inability – to make the choice between what the renaissance called, on the one hand, the Active Life and, on the other, the Contemplative Life. It makes for a touching conclusion, private yet of larger significance. In a single movement, 08.02.01 takes its title from the date of its first performance, when it was performed by the Arditti, along with the third and fourth quartets, at a concert in St. John’s, Smith Square. The date also happened to be that of Irvine Arditti’s birthday. The piece has an uneasy intensity, a sense of anxiety and tension which is left unresolved in a way which builds up an expectation of further developments, of further movements, but comes to an ending, in which nothing is ended, without such things happening. The Fifth Quartet is, again, in three movements. The first starts off with a reassuring sense of certainty and purposefulness, persuading us that this music knows precisely where it is going. But doubts arise, questioning interjections are insistently made. There is something of the same innerness of gaze which characterises the Fourth Quartet, and in the central movement certainties seem largely to have disappeared; we are in a mental world of scurrying motifs, where it is difficult, perhaps impossible, to distinguish the stable from the fugitive. This is an evanescent world, where ideas and impressions are too flickering, too quickly formed and unformed, for one to be able to put one’s trust in them. There is more confidence, more that can be depended on, in the “flowing and vigorous” (Jack’s marking) third movement; now there is a more affirmative note, a greater sense of a world in which the self can be sure of its own existence and significance – though such confidence remains qualified and tentative. Jack’s is not a music in which arrogance, complacency or the sense of a trial triumphantly overcome have a place. Of the Sixth Quartet Jack tells us that when he began it he “felt it was going to be too light to call a quartet, though it turned out to be just as serious as its predecessors”. But, as Jack goes on to observe, it still seems apt to subtitle it a ‘serenade’ because “it is rather like a collection of character or genre pieces”. The five movements have titles: Aubade – Berceuse – Scherzo – Retrospect – Prospect. The opening Aubade is very much a dawn chorus, full of the conversation of birds against a slowly developing, slowly awakening, accompaniment in the bass. This is a quite beautiful movement, rich in a sense of anticipation, but also mindful of the night just ended. The Berceuse is rather more ominous than one expects from such a piece, its calmness thoroughly troubled, the reassurance it offers only very partial. The central scherzo offers a brief point of more extrovert energy, before Retrospect – marked “very slow: calm and hypnotic” – reminds us of the Berceuse. If the fourth movement ‘rhymes’ with the second, so, in a sense does the fifth rhyme with the first. The birds of the Aubade are replaced, in the Fifth, by music which has the fluidity of moving water; the opening skies of dawn are those under which a Prospect (as much spatial as temporal) is explored. All of these quartets have their rewards to offer. This is intelligent, concise, searching music and it gets performances of high artistry and commitment. It is hard, indeed, to imagine better or more sympathetic performances.